Former Hezbollah leader Subhi al-Tufayli has accused current leaders of Lebanon’s militant group and Iran of the double crime of fighting alongside the Syrian regime and stoking the fire of a regional Sunni-Shiite war. He made the accusation in a wide-ranging, two-hour interview on Be Mawdou3ia (Arabic for “Objectively”), a weekly program hosted Monday nights by Walid Abboud on MTV Lebanon. Tufayli spent nine years studying theology in Najaf and was influenced by the teachings of Ruhollah Khomeini. He was spokesman for Hezbollah between 1985 and 1989, and became the militant Shiite group’s first Secretary-General from 1989 until 1991. Abboud: What’s going on at the Syrian-Lebanese border? What’s this tension all about? Why the on-off exchange of fire? Tufayli: I said previously the war in Syria was taking an alarming turn and that Syria risked biting the dust. I warned of the war’s repercussions on Lebanon. I was trying then to avert a spillover and urging Lebanon’s Sunnis and Shiites to stand together and spare Lebanon the Syria war fallouts. I didn’t imagine we would choose – of our own volition -- to join the sedition in Syria. Abboud: …Do your meritorious sons include the Hezbollah leadership? Tufayli: I include some of the leaders, yes. I remind the rest that each time some members, some Iranians, tried to put us off-course and have us fight wars here and there against this side or that, we refused and remained focused on Palestine… Today, to put it bluntly, we are fighting in Syria. Abboud: Who is fighting in Syria? Abboud: Is Hezbollah fighting in Syria, or is it defending or helping Lebanese in villages there? Tufayli: It is fighting in Syria. Abboud: Those in Syria are defending themselves. Tufayli: I don’t want to hide behind my finger. The Shiites in Syria don’t need someone to defend them. We compromised them and we ensnared them. If they are in danger, we are to blame. We are responsible for any harm befalling any Shiite in Syria. We got them in trouble. We caused them pain. They didn’t need our help or our solidarity. Even today, we can still take the correct steps and desist. By so doing, Syria’s Shiites would be spared Syria’s tragedy. Abboud: But Hezbollah does not speak of Syria’s Shiites. It speaks of the Lebanese Shiites residing on Syrian territory. Tufayli: I am referring to both. Moreover, the stones of the shrine (in the Damascus suburbs) of Sayyeda Zeinab do not need our protection. All this is haywire and meant for the naïve. The real aim (of Hezbollah now) is to protect the regime – a tyrannical regime killing its own people. Is it conceivable to see the Syrian people being slaughtered and shelled by all sorts of weapons? Not once did Syria fire a missile – of the types being rained on Aleppo, among other places -- toward Palestine, not even in (the Israel-Hezbollah war of) 2006. To avoid saying it is defending the regime, Hezbollah invented all this rubbish about protecting Shiites, the Lebanese in Syria and the Sayyeda Zeinab shrine. Hezbollah is implicating Syria’s Shiites. Hezbollah and Iran are accountable for every Shiite life lost in Syria. They are responsible for every house destroyed or tree cut in Syria. We could have spared the Shiites of Syria, Lebanon and the region this hateful sectarian conflict. We claim to be followers of Imam Hussein and his struggle against injustice. And what we have in Syria are people wanting to rid themselves of an unjust ruler. Our legal, religious, moral and humanitarian duty is to take the side of the oppressed Syrian people. Any other stance is a heinous crime for which we will be held accountable before God. Tufayli: A martyr because he killed Muslim children, because he panicked them, a martyr because he destroyed their homes, a martyr because he is allegedly liberating Palestine? No, such a person is destined to hell, according to the Holy Quran. Abboud: There’s more now to the Syria war – internal, regional and international factors and talk of an attempt to bring down the Axis of Resistance represented by Syria, Hezbollah and Iran? Tufayli: What I can say is that a regional Sunni-Shiite conflict would benefit Israel. Our involvement in Syria serves Israel. In addition, neither side will be allowed to win the Syria war. The powers that be and Israel want both sides to end as losers. Their interest is for the Ummah (Islamic nation) to self-destruct -- whether in Lebanon, or Syria or Iraq… The United States wants the regime to continue destroying Syria for now. Abboud: Are you therefore asking the Iranian leadership to also leave the Syrian regime – its strategic partner – to its fate? Tufayli: If the price of supporting the Syrian regime is leading to lose Syria, Lebanon and the Ummah, I have to rethink my strategy – unless I am bent on serving Israel’s interests. I know that Israel today is elated by Hezbollah’s course. Israel would be happy to defend Hezbollah so long as Hezbollah continues to fight in Syria. Who can render Israel a better service? Abboud: But Hezbollah leader Hassan Nasrallah is keeping up his threats to hit Israel hard if it launched any attack. 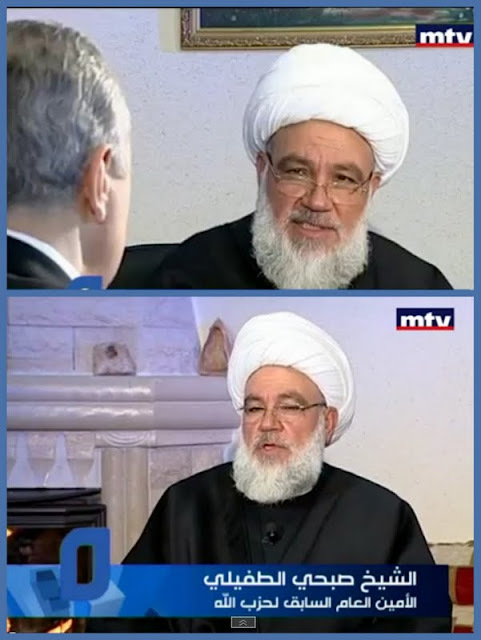 Tufayli: Israel today is very keen to see Hezbollah fighting in Syria and the Ummah falling to pieces. Khomeini called for unity and not for internecine strife in the name of the Axis of Resistance. Abboud: If, as you said, Israel is off Hezbollah’s back now, how do you explain Hezbollah sending a drone over Israel (last October)? Tufayli: You could say it was probably to obscure Hezbollah’s role in Syria – like its jargon about defending Shiites in Syria and the Sayyeda Zeinab shrine. Labels: Axis of Resistance, Hezbollah, Imam Hussein, Iran, Islam, Israel, Khomeini, Sayyeda Zeinab shrine, Shiite, Subhi al-Tufayli, Sunni, Syria, The other face of Hezbollah, U.S.